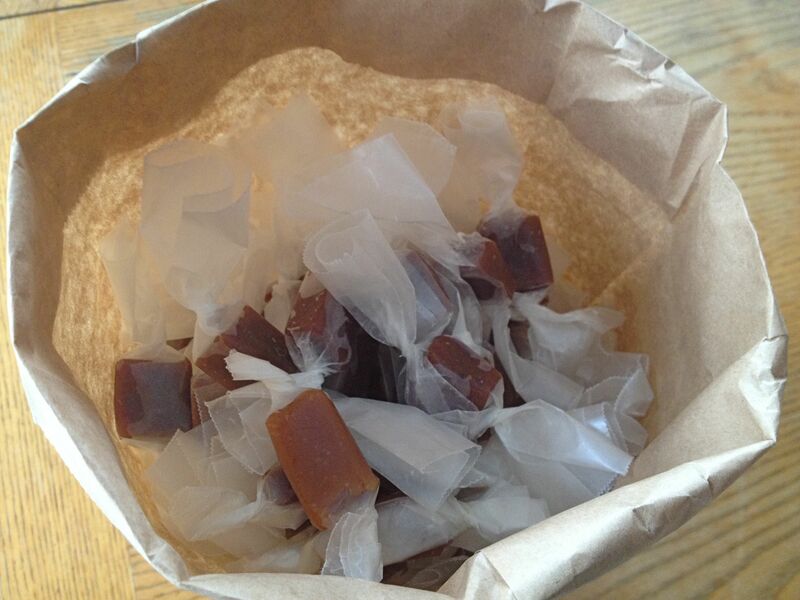 What could be sweeter than a paper sack of wrapped handmade caramels? I know that strawberry and chocolate and all things red, white, pink and chocolate are kind of the official flag of Valentine’s Day. But, I can’t grow those things on my farm, particularly not in January. And if you’ve been hanging around here for any time at all, you know I’m all about cooking from home. Recently, I took part in a cook-along book club hosted by the awesome From Scratch Club where we read and cooked our way through Alana Chernila’s perfect book, The Homemade Pantry. If you think a cook-along book club sounds like a great idea (you know you do), check out FSC’s newest selection – I’m pretty excited about it – and join in. Okay, I know, I’m starting to wander off. We’re talking Valentines. Homemade. From local produce, preferably your backyard. 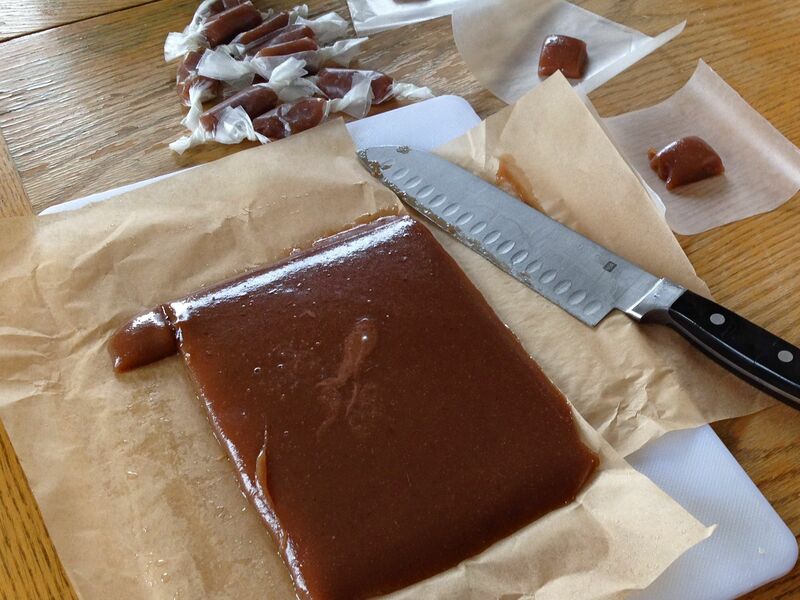 The reason for mentioning Alana’s book is that one of her recipes was for homemade caramels. 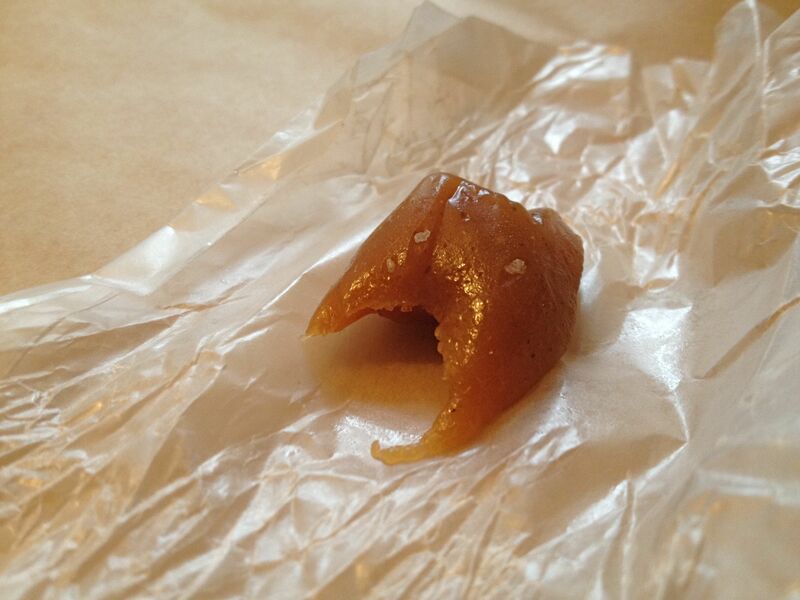 I don’t think I’ve ever in my life purchased a caramel, craved one or even given a moment’s thought to one. Who knows why, because whenever I’ve been given one, I always think they’re delicious. But somehow that recipe caught my fancy. Then, as weirdly happens so amazingly often, I stumbled across this recipe from Deb at Smitten Kitchen. You know I just happen to have freshly made quarts of Apple Gack looking for work, so this was pure fate. I was even able to fast forward straight to the middle of the recipe, since the first part is essentially making Apple Gack from cider. 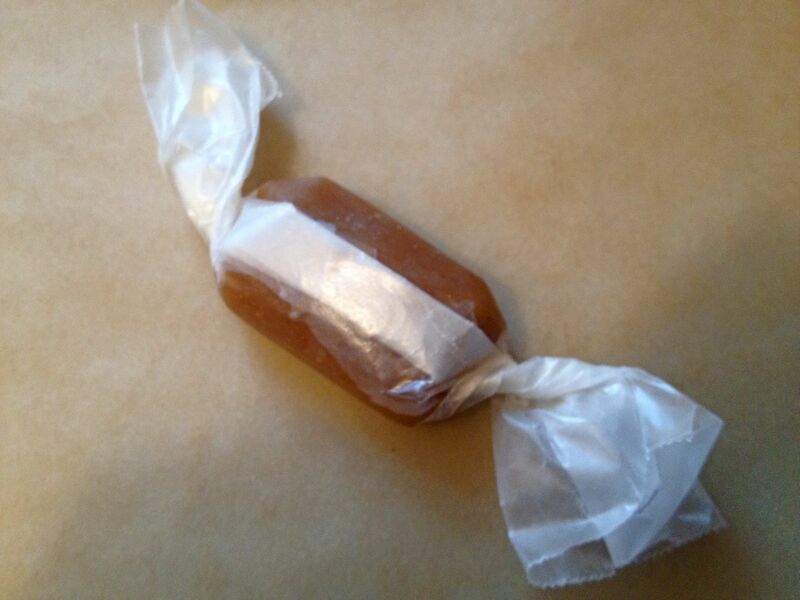 Apple Cider Caramels were meant to happen. And, if you know me at all, you know I can’t just follow a recipe. If I can make apple cider caramels, what about my overcooked strawberry jam failure that I couldn’t bear to throw away? Up from the basement those jars of stiff, sticky paste came, I thinned it with some boiling water & strained the berries to make strawberry gack. Maybe you have some unloved jam sitting around too. Follow Smitten Kitchen’s recipe using your jam gack instead of the apple, adjust the spice to suit the fruit (or eliminate it altogether) and Wa-la! 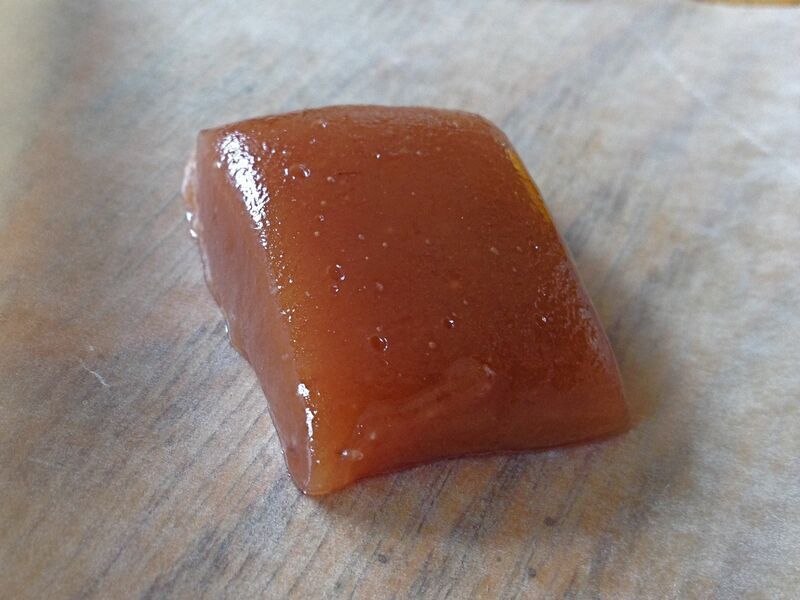 Your very own fruit caramels. I guess I could have dyed them pink or something, but I like the natural look. The strawberry was delicate and hard to place as a flavor, but totally delicious. 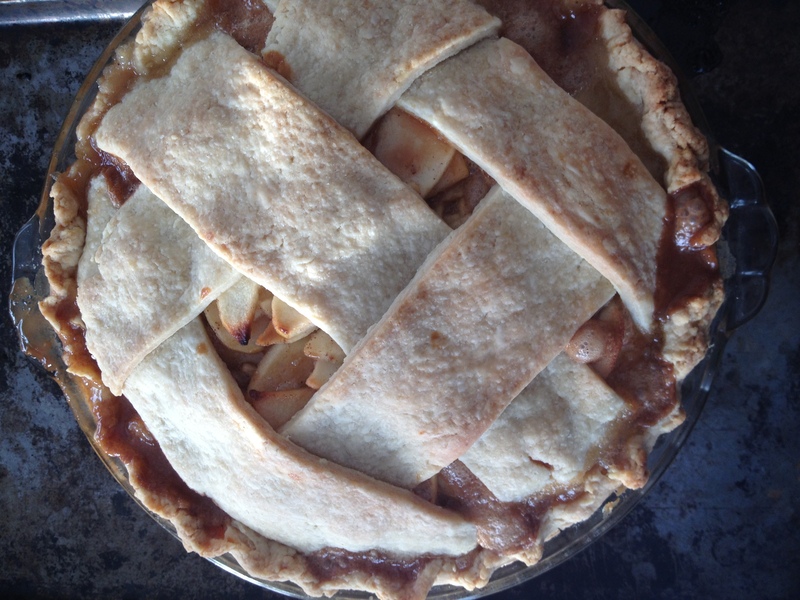 The apple cinnamon was unmistakable, as was the pumpkin. 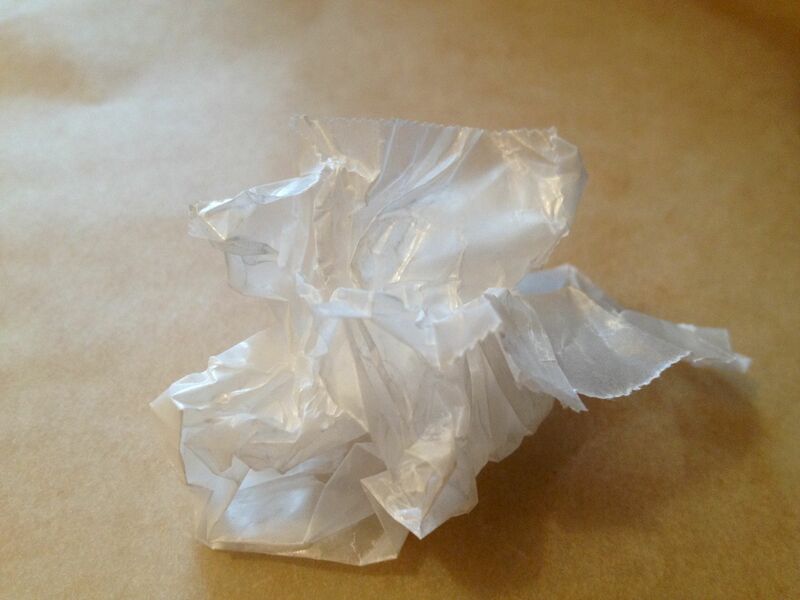 What could be more charming than a paper sack of sweet, handmade waxed paper wrapped caramels? I promise they aren’t difficult and you don’t need a candy thermometer or anything complicated, expensive or special. So delicious and tender, it’s a staple around here now. “Fresh Foods Wednesday,” you ask? I was thinking about purchasing “The Homemade Pantry”…do you recommend it? I like to cook from scratch and produce staples at home (ketchup, bread, pickles, etc.). I do Trisha. It’s a well organized way to stock your pantry and is a pleasure to read. Thanks for the reply–I’ll definitely pick it up. We have a suburban home on the main line of the Philly suburbs. It’s hard to find anyone around here that would have it and could recommend it. I think I’ll head to the bookstore so I can try some of the recipes this weekend. Thanks again! These are beautiful! And from your backyard! I am so afraid of what they might do to my waistline Jackie. For a week or so my kitchen was a little caramel factory. I had to share with everyone because I could not stop eating them. I had to shut the factory down, lol…my pants will definitely be shrinking if I keep it up. You’re pretty awesome yourself Kristy – keep up the hard work.